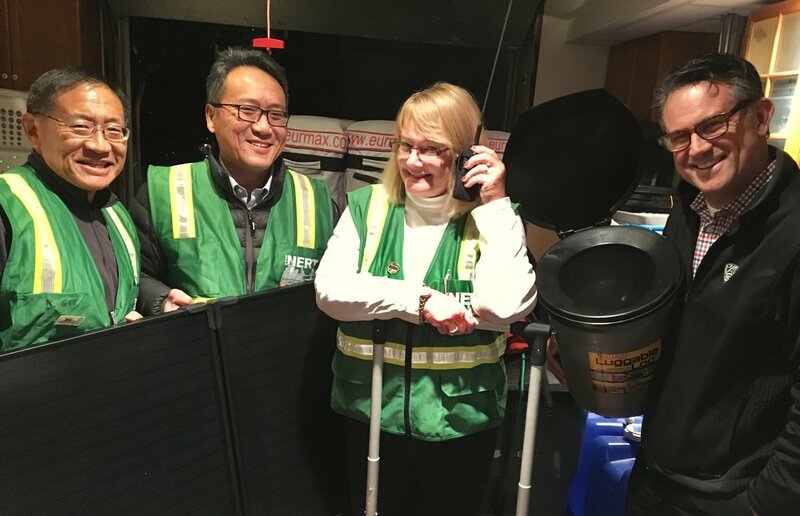 Miraloma Park neighborhood association board members Robert Gee, Bill Kan, Joanie Van Rijn and Daniel Homsey play with the solar-panel generators, emergency radios and portable toilets stored in Gee’s garage. The volunteers helped make their community one of the safest places to be when disaster strikes San Francisco. Sometimes a popcorn machine is not just about the popcorn. Residents at a neighborhood block party in Miraloma Park didn’t realize their hot, buttery treat was actually a survival test. The party was dubbed “Neighborfest,” which is a citywide initiative run by the Neighborhood Empowerment Network designed to make disaster preparedness fun. The event lets neighborhood leaders practice using their safety response gear for when the next big earthquake or fire hits San Francisco. At the Miraloma Park party last fall, organizers communicated with their emergency radios to manage the crowd of 500 residents. They set up triage tents as game booths. Solar generators powered the sound system for live music — and the popcorn machine. The hot dogs with grilled peppers and onions were part of the test, too. Volunteer cooks served 350 hot dogs without a hitch. But the popcorn machine’s source of solar power only lasted an hour. Neighborfest left the Miralmoa Park team exhausted and exhilarated. It taught lessons that boosted their confidence to handle any crisis. Yet no one imagined how soon the neighborhood’s resolve would be tested with an actual catastrophe. That night, a fire engulfed a house on Molimo Street and threatened to spread to a row of attached homes. Robert Gee and Daniel Homsey, block party organizers and board members of Miraloma Park’s neighborhood association, each awoke to popping sounds and an inferno near their homes. While the fire claimed one life, it was contained without further injuries. Homsey credits the preparations Miraloma Park has made to meet the criteria of Resilient San Francisco. City Hall’s Resilient SF and the Neighborhood Empowerment Network (NEN) work with other groups with life-saving acronyms like the fire department’s Neighborhood Response Team (NERT) and the police department’s Auxiliary Law Enforcement Response Team (ALERT). Their shared mission is to help communities get organized to take care of themselves in the critical first days of a disaster when government services will be spread thin. When a minor tremor centered in Berkeley jolted much of San Francisco awake in the middle of the night earlier this month, it was a reminder to prepare for the Big One. In a large-scale disaster, neighborhood volunteers like Joanie Van Rijn will initially focus on search and rescue. Van Rijn was instrumental in securing disaster gear for Miraloma Park and planning Neighborfest. She helped make sure every public safety agency had a booth to present survival tips. It’s part of the NEN plan — use Neighborfest parties as a fun way to educate residents and get them to know each other. Miraloma Park is a quiet community of 2,200 single-family homes built in a mix of storybook, art deco and mid-century modern styles. It’s nestled below Mt. Davidson. An active volunteer neighborhood association hosts holiday parties, cook-off contests and cultural performances. They also advocated for funding and support a new program called Miraloma Community Connectors to “turn strangers into neighbors and neighbors into friends.” The focus is helping isolated seniors age safely in place. There are weekly coffee klatches, quarterly pot-lucks and volunteers to run errands. The effort to encourage community bonding makes Miraloma Park one of the best-prepared areas of San Francisco. Every neighborhood should emulate it and enjoy the benefits.